On the one hand, it’s easy to say that the competition between the two platforms will ratchet up in intensity as new users and markets begin to dwindle. 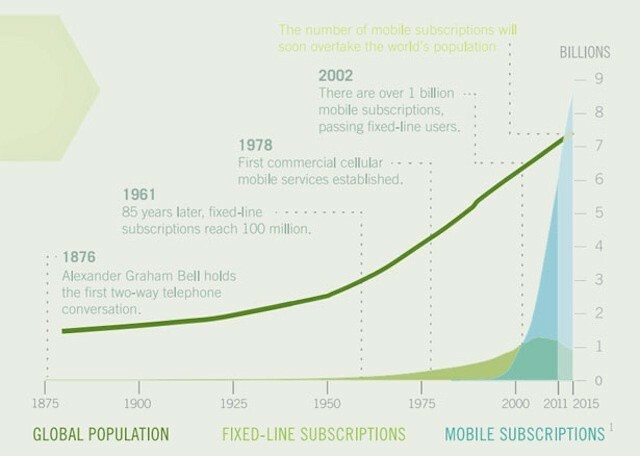 Currently, 75% of the world’s population owns a mobile phone or mobile device of some sort. At the same time, however, that still leaves 1.5 billion people who currently don’t use or have access to mobile technology (not to mention people who own a basic mobile phone rather than a smartphone of any type). The most interesting point posed by this realization that the mobile market isn’t going to continue expanding indefinitely is that platforms and integration across devices will become more important over time than the capabilities or cost of individual devices. Apple clearly saw that point coming a long time ago. With the release of the first iPod, Apple began to carefully construct a platform and ecosystem around its solutions. That work has paid off quite well for the company. One important fact about Apple’s approach is that its products deliver the best user experience when a customer owns more than one Apple device. Here’s one example: iCloud and Photostream on an iPhone delivers pictures to a Mac or iPad for editing in iPhoto and to an Apple TV as a screensaver. At various points along the process those photos can be printed, turned into greeting cards that are printed and mailed right from an iOS device, organized into albums and journals, or printed as glossy photo books – all with minimal effort. Other companies operating in the mobile space like Samsung, LG, and RIM have discovered the importance of such an integrated and seamless platform experience. They have, in fact, rushed to build their own versions of that ecosystem. One difference, however, is that Apple took years to build its overarching platform. It carefully added features layer by layer and responded to its customers needs at almost every stage in the process. Apple was very patient and meticulous. It didn’t try to create all this integration around a single product or in a single year. That means that every piece of the puzzle was seriously considered and very well thought out. The return on that investment is that Apple’s ecosystem is incredibly integrated and intuitive. It is a more mature platform and that often shows. Ultimately, Apple’s integrated platform approach is not only attracting new customers and retaining them with incredible platform loyalty, it also encourages customers to buy multiple mobile and non-mobile devices. If there is a point where the world market stops expanding, that becomes a very significant advantage.